The world changed in 2001 and Lycoming Head Coach Frank Girardi was someone who kept things in perspective and gave much needed support. WILLIAMSPORT, Pa. – At the end of the 1971 football season, Frank Girardi got a knock on his door. 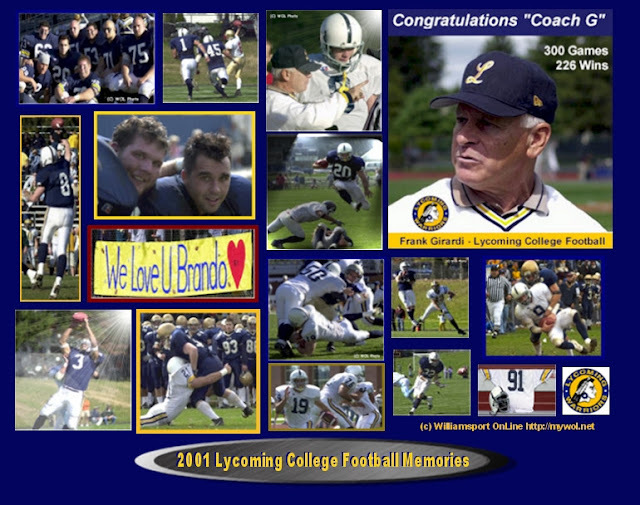 An assistant coach for the Lycoming College football team, he was surprised to find then-Lycoming College President Harold Hutson there. The conversation was quick, as Girardi remembers it, and by the time Hutson left, Girardi was the head coach of the Warriors. Over the course of the next 36 years, Girardi cobbled together one of the finest resumes in the history of college football. He won 257 games, which still ranks 16th all-time in NCAA history. He helped Lycoming win 13 Middle Atlantic Conference titles and make 11 appearances in the NCAA Division III Tournament. He led the Warriors to the national title game in 1990 and 1997 and the semifinals in 1996. On Friday, Jan. 8, he was rewarded with perhaps the biggest honor of his career, as he was announced as part of a group of 16 inductees that are part of the 2016 National Football Foundation & College Football Hall of Fame class, the foundation announced in Scottsdale, Ariz., as part of the pregame festivities at the College Football Playoff. One of only 29 coaches to record 200 or more victories at one school, Girardi did indeed struggle for the first three seasons of his career, as the Warriors compiled a 7-18 record in those years. A developing defense matured in 1975, however, as it led Division III by allowing just 133.1 yards per game and propelled the team to 6-2 record, starting that run of 29 straight winning seasons. 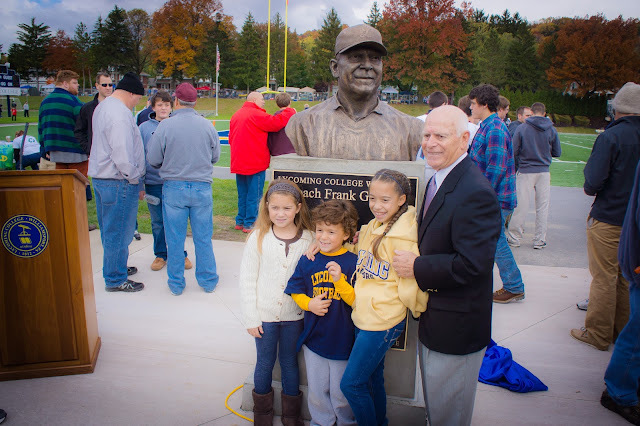 Retired Head Coach Frank Girardi loved by everyone. In 1976, the defense led the nation in rushing defense, allowing just 44.3 yards per game, helping the team set a school-record for wins with an 8-1 record, a mark his teams would go on to break four more times before the 1990 and 1997 teams set the current standard with 12-1 marks. The hallmarks of Girardi’s teams seemed to always be the defense, which led Division III in total defense twice (1975, ’83), rushing defense three times (1976, ’82, ’87) and scoring defense once (1999) during his career. By the mid-’80s, though, his offenses had the firepower to match the defense, leading the MAC in total offense for the first time in 1984 (178.5) and four more times in his career. Assistant Head Coach and Defensive Coordinator Steve Wiser played for Girardi and coached with him until Coach "G" retired. With the winning seasons came new goals and by the late ’70s, the Warriors were in contention for MAC titles nearly every year. A 14-0 loss to Albright spoiled the team’s chance at a title during an 8-1 season in 1976, but two years later, Lycoming picked up a share of MAC Northern Division title with a 5-1 conference record and then did so again in 1979, posting a 6-0-1 mark in conference play. 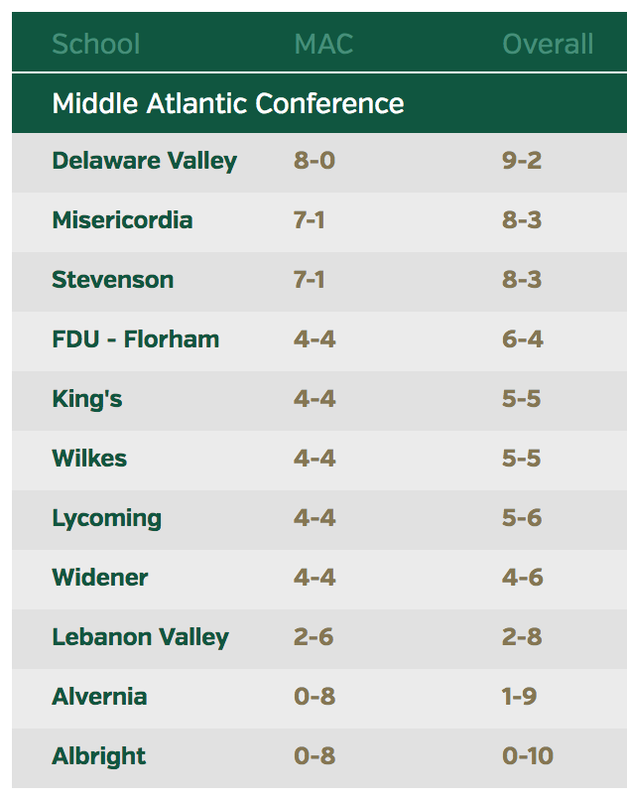 Those two championships set off a run where every four-year graduating player at Lycoming for the next 25 years left with at least one MAC Championship. More incredible seasons followed as Girardi built the Warriors into a regional powerhouse in the ’80s. In 1985, the team, led by All-American quarterback Larry Barretta, recorded its first undefeated regular season in program history, going 10-0 to earn the program’s first bid to the NCAA Division III Tournament. In 1989, the Warriors won their first tournament game, beating Dickinson, 21-0, in the first round, setting up a magical decade that followed. With a defense that pitched four shutouts, the Warriors steamrolled through the regular season in 1990, finishing 9-0 before posting wins over Carnegie Mellon and Washington & Jefferson to reach the national semifinals, where they were decided underdogs at Hofstra, which had recently announced it was moving to Division I. The Warriors had a more pressing problem early that week, though. They had no shoes to wear on Hofstra’s artificial turf field. In a move that earned national attention, Girardi called Penn State coach Joe Paterno to ask for help and soon after, boxes upon boxes of turf shoes showed up at the gates of Person Field. Days later, the Warriors upset Hofstra, 20-10, to reach the national championship game. In another historic event, the Amos Alonzo Stagg Bowl in 1990 was the first national championship at any level to go into overtime, as Lycoming came up just short to Allegheny, 21-14, in Bradenton, Fla. Still, the season proved that the Warriors were prepared to become a powerhouse, and in the ’90s, they turned into one, winning seven MAC titles in the decade, making four appearances in the NCAA quarterfinals, three in the semifinals and reappearing in the NCAA Division III championship game in 1997, thanks to another tremendous upset, overcoming a 20-0 halftime deficit to defeat Rowan, 28-20. As the seasons progressed, the wins piled up and despite a 1-4 start to the 2005 season, the team finished the year with five straight wins. That final win, a 17-10 overtime victory against rival Susquehanna, ended with Girardi being carried off the field on the team’s shoulders with 250 career wins. 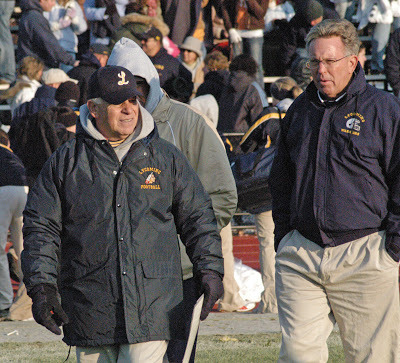 By the time Girardi decided to retire at the end of the 2007 season, Girardi had coached 82 All-Americans, 328 All-MAC selections, five Academic All-Americans (including Academic All-America Hall of Fame Member Vanaskie), 13 Academic All-District picks, 13 Lycoming College Male Athletes of the Year, seven MAC Most Valuable Players/Players of the Year and 58 members of the Lycoming College Athletics Hall of Fame. 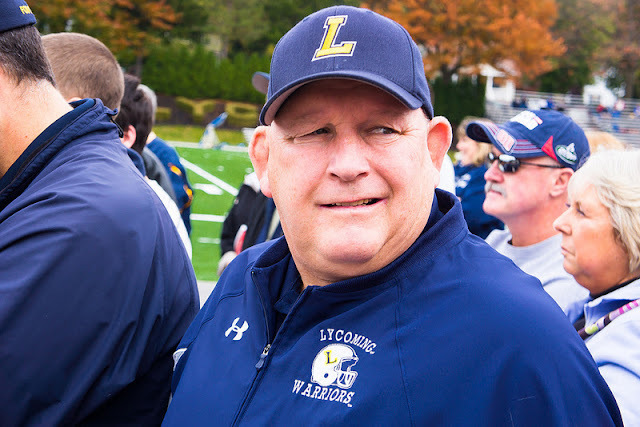 Part of the success that helped build the Warriors into a national power came from the fact that Girardi was able to make all of his players and coaches feel comfortable from the day they first visited Lycoming to the day they left. Another key component was the atmosphere level-headedness with which Girardi conducted his work both as a football coach and as the college’s Director of Athletics from 1984-2007. After growing up in the shadows of the college, Girardi came to the school in 1969 as an assistant coach under Whitehill, serving as an assistant for three seasons before Dr. Hutson knocked on his door. 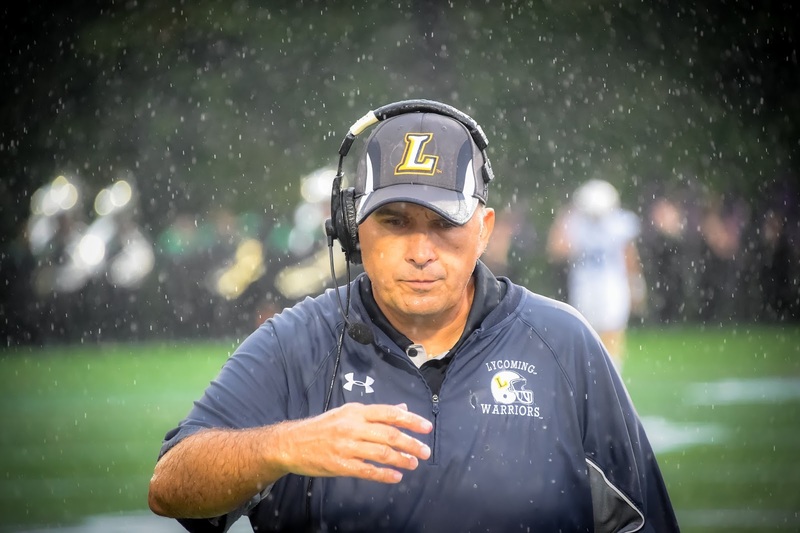 A star running back at Williamsport Area High School and a letter winner at West Chester University under the legendary Glenn Killinger, Girardi served as head coach of Jersey Shore Area High School before joining the Lycoming staff. Girardi has been inducted into five other halls of fame, including the Lycoming Athletics Hall of Fame (2010), Middle Atlantic Conference Hall of Fame (2012), West Branch Valley Chapter of the Pennsylvania Sports Hall of Fame (1990), the Pennsylvania State Sports Hall of Fame (1998), and West Chester University Hall of Fame (2005). 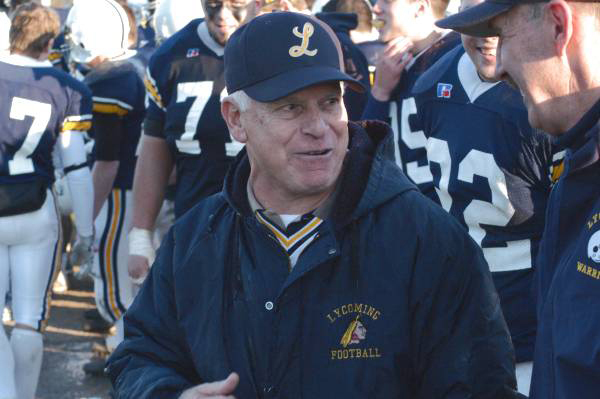 In 1999 he became the Robert W. Maxwell Football Club’s first recipient of the Tri-State Coach of the Year Award. The award is presented to an outstanding college or high school coach from Pennsylvania, New Jersey or Delaware. Following the 2007 season, ESPN Radio 1050/104.1 honored Girardi with a lifetime achievement award and announced that the award will carry the title of “The Frank Girardi Lifetime Achievement Award.” He was also given a Lifetime Achievement Award from the Central Pennsylvania Chapter of the National Football Foundation in 2012. “His strongest trait were his interpersonal skills. He’d get on you when he needed to, but he did an incredible job in instilling confidence in his players and his teams. While we were talented, I think he convinced us that we can do great things. "When I was playing, the big game was always against Susquehanna, but the week before that game, Coach G always told us we had to take care of business so that the game against Susquehanna would mean as much as it should. That experience of taking things one game at a time is something I tried to teach the (Red Land) team from our first day."